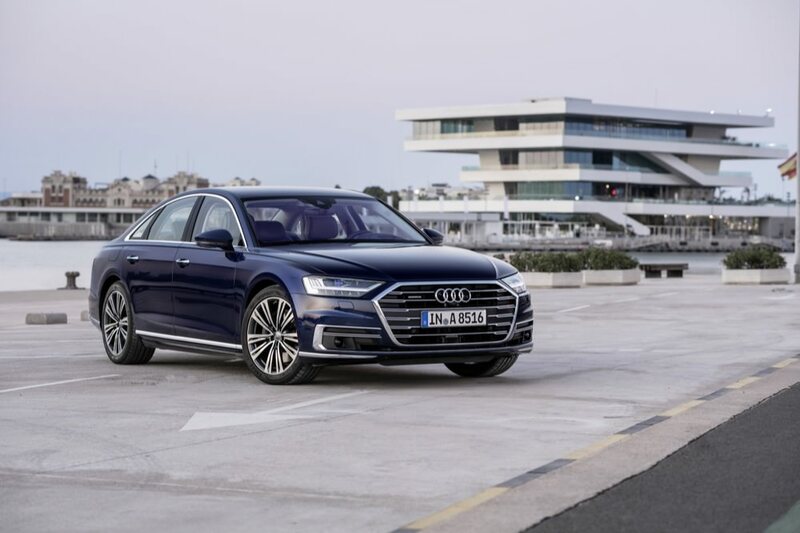 The latest generation Audi A8 is the company’s most technologically advanced car yet. It will come crammed with the latest in driver assistance and will feature Level 3 autonomy. But there is much more to the new A8 than the headline-grabbing autonomous driving feature. Here are eight cool things about the new Audi A8. For cars equipped with the AI Active Suspension, there is a passive safety feature that can help reduce the risk of injury in a side impact. Sensors around the car continuously monitor what’s going on. When the car detects an impending side impact at a speed higher than 25km/h, the AI Active Suspension automatically raises the side by 80mm in just 0.5 seconds. Doing this helps to distribute the impact force through the floor of the car, instead of the door. Audi claims this can reduce the chance of injury by 50 percent. Audi’s new Garage Pilot system takes all of the hassles out of parking your car in a tight space. Thanks to a new smartphone app, owners will be able to get out of their car and guide it into the parking space via the app. You don’t even have to do much, as the car’s sensors work out the angle in which it needs to steer into the space. Once it’s done, just lock the car and walk away. One of the neat features of the new A8 is the door handles. It uses a microswitch than means you only have to pull the handle by a few millimetres for it to pop open. To ensure that you don’t just open your door without looking, Audi has devised a safety system. The Exit Warning System can detect when a cyclist is approaching the vehicle from behind, and if you happen to pull on the door latch to open it, the sensors will give you a visual warning and delay the opening of the door. This system could significantly reduce the potential risk of injury to cyclists by people unknowingly swinging their car doors open without looking. To give the new Audi A8 even more agility, it can steer with all four wheels. This Dynamic All-Wheel Steering system can turn the rear wheels in the opposite or same direction as the front wheels according to the car’s speed. At lower speeds, the rear wheels turn in the opposite direction to reduce the overall turning circle by around one metre. Above 60km/h the rear wheels turn in the same direction to make lane changes more stable and direct. Another feature of the Active Air Suspension is what Audi calls the Elevated Entry. This function instantly raises the car’s height by 40mm when you open the door. The purpose is the make getting in and out that bit more comfortable because that’s what you need in an already super luxurious car like the A8. Once the door shuts, the car gently lowers back down. All of the new A8 range will be Mile Hybrid Electric Vehicles or MHEVs. The car features a small lithium-ion battery in the rear that is used to power the driving systems at certain times. When you’re cruising along at speeds between 55- and 160km/h the car can shut off the engine for up to 40 seconds at a time to save fuel and reduce emissions. During this time, the battery powers everything in the car. The engine then seamlessly restarts thanks to a Belt Alternator System (BAS) and continues driving without you ever really noticing it. Standard headlights not good enough for you? In that case, Audi can fit the A8 with its new Laser Light technology. Distinguished by a bright blue X-shaped surround in the headlight, the laser can activate at speeds over 70km/h and shines a light so bright that it doubles the range of the high beam. There’s nothing more annoying than getting back into your car after someone else has been driving it and having to move your seat and adjust your mirrors. Well, the Audi A8 can memorise seven different drivers’ preferences and depending on the key used to open it, can set up the car to suit that person. More than 400 parameters can be programmed, right down to your preferred air conditioning settings and your favourite albums to listen to while driving.